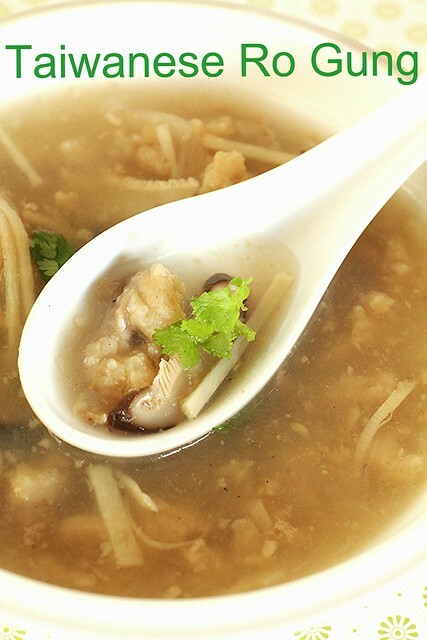 This Taiwanese specialty called Ro Gung seems to be a lesser known dish as I couldn’t find anything in my google search. (Does anyone know if this is known by another name?) The gist of this soup is that it’s a cornstarch thickened soup with soft pork and fish paste dumplings… ok blobs. That probably doesn’t sound enticing to those that don’t already know it (though I can hear my Taiwanese peeps cheering). On top of that, it’s not an attractive dish. (That cilantro garnish was my only hope for color.) What it is, is delicious! Seriously, one of my favorite foods! And for food geeks, it is a flavor profile that is unique to Taiwanese food. 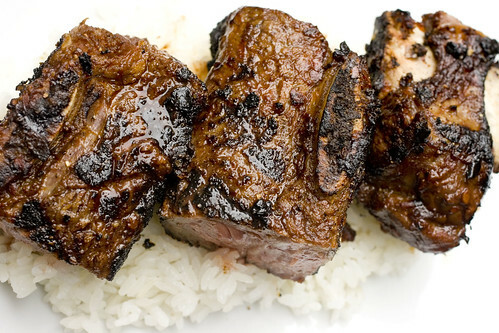 One of the most common misunderstandings of Chinese food is that soy sauce is in everything. It’s not! Further, nearly everyone that talks to me about making fried rice thinks there’s soy sauce in that (even if they know soy sauce is not in everything). 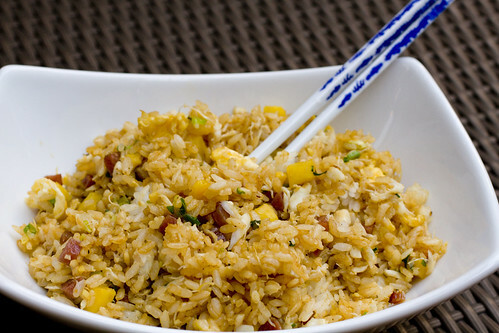 There are many different types of fried rice so while the minority may contain soy sauce, the classic/basic version and most do not. Where does the brown color come from? It comes from frying the rice which browns it. 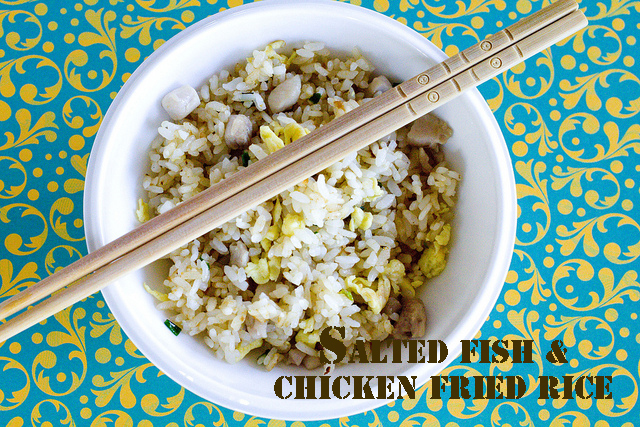 One of my all time favorite kinds of fried rice is Salted Fish and Chicken Fried Rice. Please do not put soy sauce in it. One of the tips/tricks that makes this possible is offering a mix of dishes she already made ahead of time with one or two that can be thrown together really quickly. She might have marinated cucumbers in the morning as we got dressed for school. 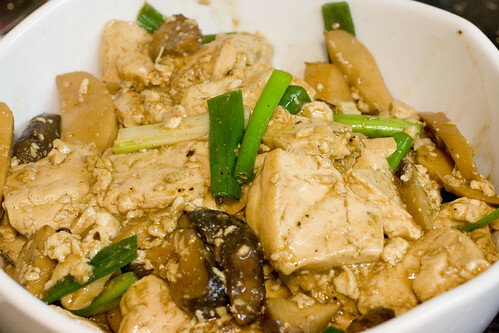 A variety of “red-cooked” meats, egg, or bean curd was probably made on the weekend. When she walked through the door, she’d whirl around the kitchen: steaming a fish and stir-frying another two like it was as easy as skipping. This led me to some wrong assumptions. I thought that every mother in the world did that and I thought it was no-sweat, easiest thing ever. I know now, I was so wrong. For every picnic, every class trip, every water park day, and every opportunity for packed lunch, I asked my mom for sushi. Little did I know then that the “sushi” my mom made for me is not what most would call sushi. When we think of sushi and maki rolls, we usually think of the Japanese kind or the Americanized-Japanese kind. 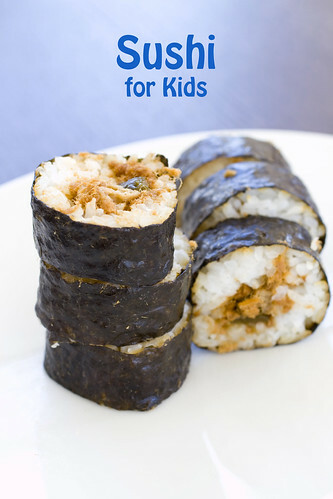 Well, the Koreans and Chinese make sushi rolls as well, mostly without the use of raw fish. These rolls are stuffed with raw or cooked vegetables, sometimes egg, sometimes pickles. My mom decided to make her own version for me and my brother (this is a Kelly Lee original), one with ingredients that would be safe in room temperature and carried off to school or the park. It’s easily packable finger food with the perfect balance of sweet and salty: pork floss, jang gua (Chinese pickles), and fried gluten. We loved it so much that we begged her to make these rolls constantly, and then of course our cousins tried it, our friends tried it, and all the kids would scream for it. Sometimes my mom would have to make these continuously all day as we played. I spent Monday at mom’s house again and we decided, well I decided, that I wanted to learn my grandfather’s two favorite dishes. My grandpa, on my dad’s side, lived till he was 96! I remember what a bad example that set for us kids. He never ate veggies and yet he was as healthy as a pup, taking walks every day. Well, his walks were to Baskin Robbins. Besides the Mint Chocolate Chip ice cream cone each day, his favorite dish was Tee Pong. 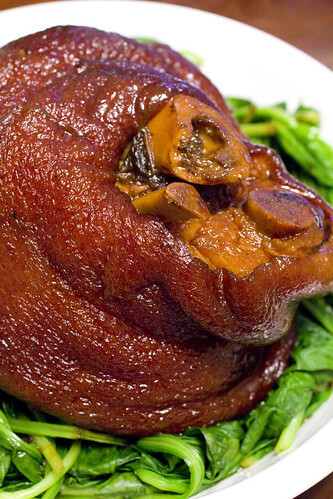 It’s a Red-Cooked or Red-Braised Picnic Shoulder, and it’s all about the skin and fat. Brace yourself. The fat and skin can be more than an inch thick, and that’s the part my grandpa wanted to eat, sometimes leaving the meat behind. There are so many versions of fried rice. I’m not even going to try and guess how many there are. Yet, what makes it a fried rice? My mom once told me that the very basic Chinese version is just scallion, egg, and rice. That’s all you need for fried rice and any other additions are your choice. Why can’t looking for apartments be as easy as looking for recipes? We’ve been looking for a place to move to, on and off, for two years now, with no end in sight. When I look for recipes, I find what I need most of the time. The two processes are actually quite similar. Step 1: narrow down search by criteria. Step 2: Try it out. This is where they start to diverge and force a completely different step 3, and that’s where apartment hunting becomes my least favorite activity now. It’s pretty un-like me to toot the horn of my Asian peoples, but I have to hand it to them, they are geniuses when it comes to using beans. Some times, you even forget that the famous soy sauce, all that liquid umami, is made from fermenting soy beans. 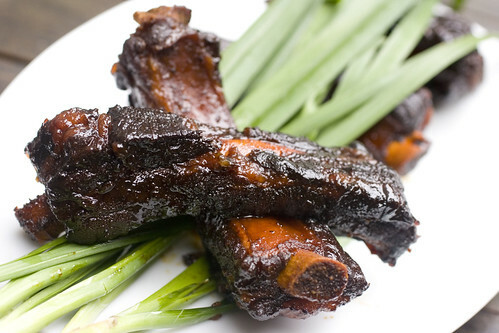 Then there’s black bean sauce, also a fermented bean, which is responsible for dishes like Clams in Black Bean Sauce. The Bomb! Lesser known ones like ground bean paste, sweet bean paste, broad bean paste, and more, fill my mom’s pantry. Who would have thought to make all these great sauces from beans? Well, thank goodness somebody did, because they are all vital in a Chinese kitchen. This is not a traditional bibimbop, but I think of bibimbop as one of those “everything but the kitchen sink” recipes. I make it when I’ve got a bunch of random vegetables I want to use up and I want it all to amount to a one-bowl meal. 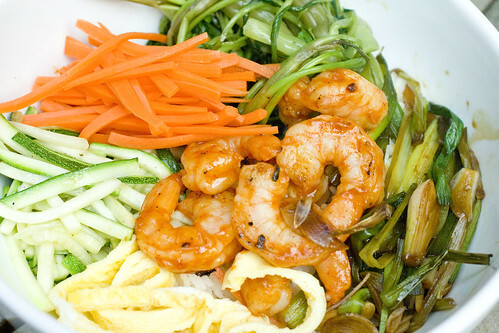 Most commonly, bibimbop has bulgolgi, a Korean marinated beef. I didn’t have any beef so this one uses shrimp. I didn’t have any bean sprouts, but that’s ok. 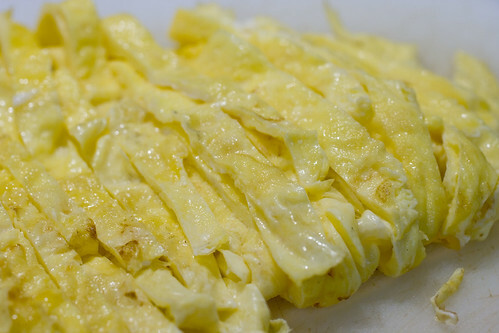 Traditionally, it’s an egg with runny yolk but Lon doesn’t like those so I chose to make a thin omelet and slice it up. See how flexible it is? I feel like every college kid should learn the jist of bibimbop because it’s an easy way to make a healthy meal. Where I use water convolous, you can use spinach or any greens. Instead of shrimp, try chicken, pork, or beef. If you prefer, use brown rice. You get the idea…All you need is the red pepper sauce (gochu chang) and it’ll be delicious! 1. 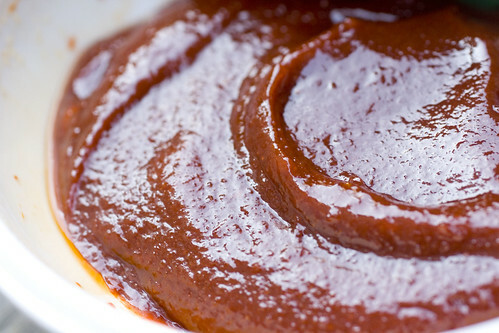 Make the red pepper paste by stirring the ingredients together in a small bowl. Set aside. 2. Throw carrots in boiling water for just a few seconds. Remove and rinse with cold water. Drain. Set aside. 3. Heat 1 teaspoon of oil in a large flat pan on medium heat. Pour in egg mixture and swirl to coat the bottom. As soon as the bottom is solid, try to flip it over. It should finish in 2 seconds. Remove from heat immediately. When it cools enough to handle. Slice it in long strips. Set aside. 4. Heat 1 teaspoon oil in a wok on high heat. Toss in zucchini with some salt and pepper. Toss around just until tender. Remove to a bowl and set aside. 5. Return wok to heat with 2 teaspoons of oil. Add the stems of the convolous with minced garlic and salt. Toss around until tender. Add the leaves with a little more salt. Toss around until leaves wilt. Remove from heat to a bowl and set aside. 6. Use that same wok again with just a light coating of oil. Add scallions and sliced garlic with kecap manis. Toss around just until the scallion has softened a bit but is not mushy. Remove from heat to a bowl and set aside. 7. Rinse the wok and return to the flame to dry it. Once it starts smoking, add 1 teaspoon oil. Swirl it around and add the shrimp. Add 1 tablespoon of the red pepper sauce and toss to coat the shrimp. Stir around until the shrimp curl up and there’s no more grey. (It’s a little bit hard to see in this dish with the red pepper sauce.) Remove from heat immediately. Set aside. 8. Divide rice into 4 bowls. 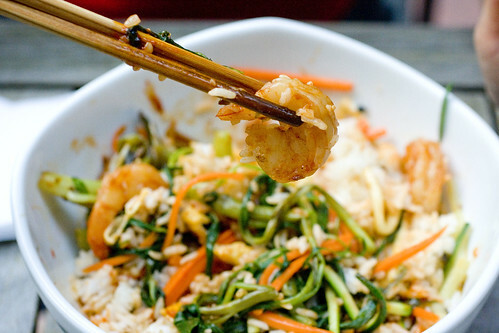 Divide each topping into the 4 bowls, keeping each topping in a neat pile and put the shrimp in the center. Top with seaweed and sesame if you want. Serve with red pepper sauce on the side for each person to add as much as they want. 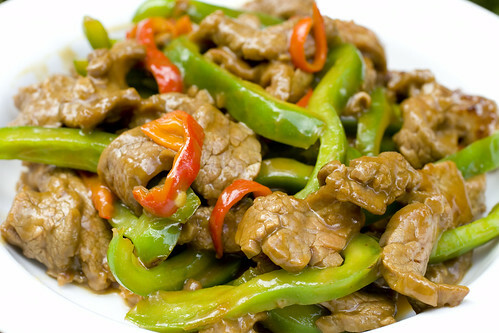 Usually the dish is served as pictured above, then the person eating it will add sauce and stir it all up. 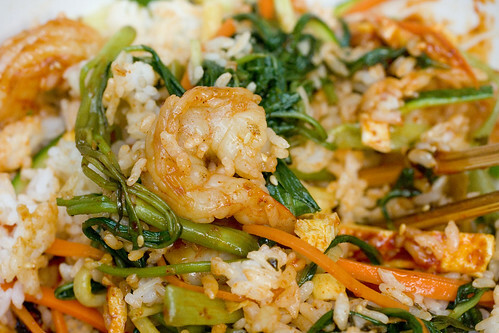 You may have noticed a ton of Chinese recipes this week. It’s because my mom taught me a whole bunch on Monday, and normally I would have spread out the posts, but then we got sick, and these are all I have. Without these, the blog wouldn’t have been updated this week, or it would have been about saltines, ginger ale, and the flavors of different cold and flu medicines. So here’s another great vegetarian recipe, healthy and flavorful. It’s a full meal if you throw it on some rice, or it’s a nice tofu course for a family-style meal. Left-overs can be kept in the fridge, and then it reheats wonderfully in the microwave.